Given the popularity of the Google Nexus 4, it’s not surprising that some who have not bought the unit yet are waiting for the white variant. So, the white Nexus 4 has been the subject of rumors and image leaks for the past several days. But those come to an end today, as LG officially put the wraps off the white Nexus 4. 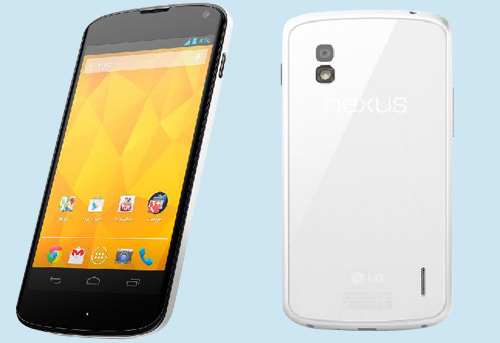 So, who’s getting the White Nexus 4? Honestly, I don’t know what’s with the white variant that many are longing for it. The black Nexus 4 is ok in my book and would prefer it anytime. But to each his own. So, for those of you who’ve been waiting for the white Nexus 4, here it is. Do we still need to reiterate how different this Nexus 4 is from the previously released black Nexus 4? We don’t. And besides, except for the colors, nothing else is different between these two Nexus 4 models. But as a review, the black Nexus 4 and now also the white Nexus 4 features a 4.7-inch 1280×768 True HD IPS Plus display with Zerogap Touch technology, Qualcomm Snapdragon S4 processor, 2GB of RAM and Android 4.3 Jelly Bean for its OS. As mentioned, the white Nexus 4 will be released on May 29 in Hong Kong. It will be released in select markets in Asia, North America, Europe and the Middle East over the next several weeks. Unfortunately, pricing of the white Nexus 4 is not yet known. But given the fact that it shares the same specs as the black Nexus 4, we expect that the price will also be the same. These are $299 for the 8GB and $349 for the 16GB models. The white Nexus 4 should also come SIM-free and unlocked. When the black Nexus 4 was released it become an instant because of its specs and price. That was prior to the release of the Samsung Galaxy S4 and other more powerful Android smartphones. It will be interesting to find out then, if the white Nexus 4 will also sell out quickly. Will you be getting the white Nexus 4 when it comes available in the U.S.? Share with us your thoughts by leaving a comment.